E Elliott Ltd. was a plastic moulding firm based in Birmingham, England, founded by Edwin Elliot in 1910. The "L-Yacht" logo was trademarked (as no.477,037) on 25th January 1927, registered to the company address 17-18 Warstone Lane, Birmingham. 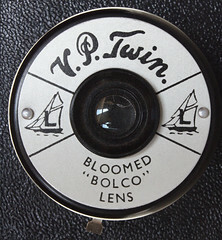 They made cameras from the 1930s to the 1950s, together with the British Optical Lens Co (BOLCO). - also owned by Edwin Elliott, and founded at the same time as Elliott's. The company lasted until the 1980s. Elliot's also made plastic parts for the neighbouring Coronet Camera Co., and in turn, bought shutters from Coronet for the V. P. Twin camera. BOLCO also made lenses for Coronet, and later for Corfield. ↑ McKeown 12th ed. p.262 says 1936, but David Gardner dates it back to 1910, with 1936 being the date of becoming a limited company. This page was last edited on 20 September 2011, at 21:26.